In the foreground of this photograph you can see the so-called "cable grave" for the High Band Array (HBA). Because it is important to control the cable lengths for the LOFAR radio telescope, each cable is made to a specific length. And to ease the manufacturing process, these lengths are standardised to a small number of set lengths. Because of the positions of the HBA tiles, there can be several tens of metres of excess cable which needs to be carefully zigzagged back and forth before the remainder of the cable goes into the RF-container. In the photograph, Harry Smith and Dave King are adding another cable to the cable grave. 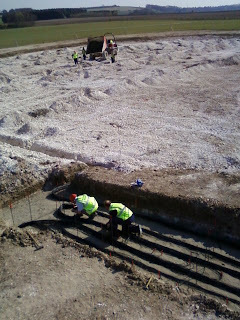 In the background, the ground works crew are adding a layer of sand to protect the recently laid cable.